Davenport, Iowa Hotel's Suites Impress GuestsThe newly remodeled Staybridge Suites Davenport hotel has all the comforts of home so you can make the most of your stay in the Quad Cities. The hotel's convenient location is off I-74, just 6 miles from downtown Davenport.The hotel's suites allow visiting Iowa professionals to stay connected with free high-speed, wireless internet access and a large, well-lit work area. Right in the heart of the Quad Cities, this hotel's convenient location provides easy access to nearby businesses, including Genesis Systems, KONE, MidAmerican Energy, Sentry Insurance, MVRBC, Arconic, Unitypoint, Hy-Vee and Von Maur. Genesis Medical Center is just 2.8 miles away.There are infinite possibilities for entertainment nearby, whether you want to watch an IMAX movie at the Putnam Museum or try your luck at the Isle of Capri Casino. Bettendorf, Rock Island and Moline each offer great shopping and dining options and are easily accessible via I-74 and I-80 in Davenport.The hotel's facility offers Iowa visitors the amenities they need to feel more at home here. After you work off your stress in the fitness center, you can retreat to the outdoor gas grill and gazebo area or enjoy a Sundowner Reception (Tue-Thu) for a fun night in. Or take a dip in the crystal clear waters of the heated, indoor pool and whirlpool. 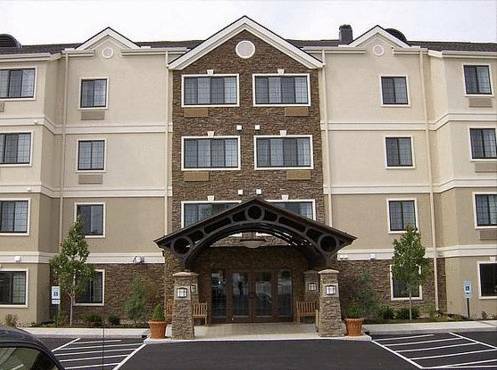 When you stay in the Quad Cities, be sure to choose the Staybridge Suites Davenport hotel. Granite City: An upscale, yet casual brewery where you can gather with friends for a good time, experience the inviting environment, and enjoy classic gourmet meals, desserts, and specialty beverages. Pints: Opened in March of 2008. This bar does not serve food but will allow customers to bring in your own food from neighboring restaurants. This bar is smoke free. Boardroom: We offer the perfect location for small meetings of 8-10 people. This room provides a large conference table and business chairs. There is wireless internet available as well as a dry erase board and a small side table for the beverage station. Duck Creek Golf CourseMunicipal 18 holes over 5,782 yards with a par of 70. John Deere Pavilion and MuseumThe legend of John Deere lives on at the world's most comprehensive agricultural exhibit. Showcases vintage & modern-day equipment, interactive agricultural displays and feature film. Largest collection of John Deere merchandise anywhere. Isle of Capri CasinoWelcome to the Rhythm City Casino in Davenport. Exciting casino action, delicious dining, thrilling giveaways and great entertainment. Circa 21 Dinner TheatreWe combine scrumptuous dining, professional entertainment, and V.I.P. treatment to make your group's visit unforgettable. Voted by Quad Citians the "Best Live Theatre"
Rhythm City Casino ResortNewest Casino in the area providing a non stop gaming experience. Fresh dining, live local entertainment, and more.